Je viens juste de finir Rat god, la derrière minie série de Richard Corben, et j'en suis tellement retourné, que je l'écris en anglais. Ps : peut-être sera t'elle proposée par Delirium en français à la fin de l'année ou en 2016, vu que le hardcover parait en Octobre aux USA ? 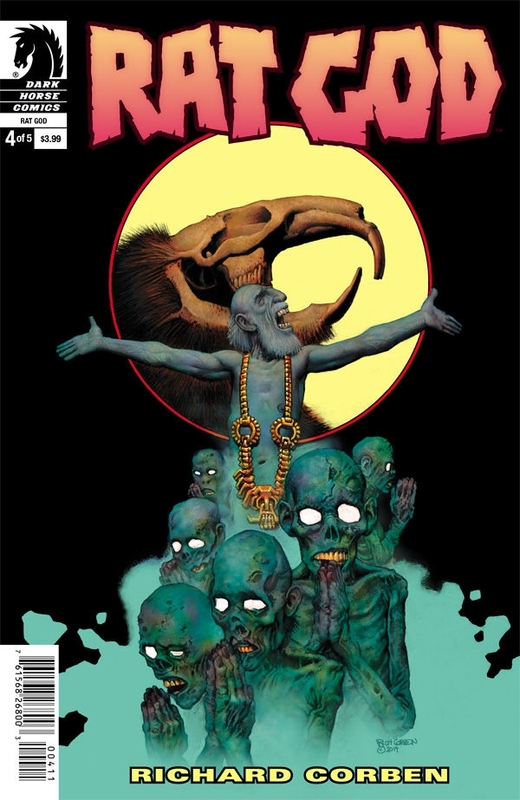 > Just finish to read Rat god 5#5 by Richard Corben, and I'm really happy. 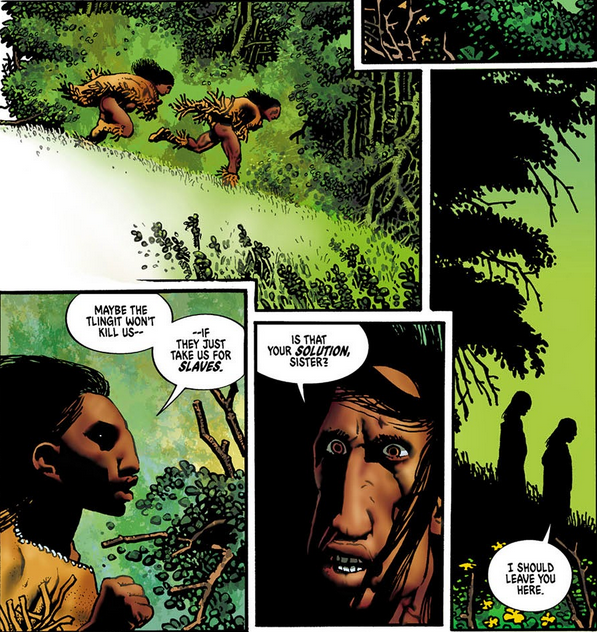 I'm a huge fan of Corben's works, and try to catch everything I can (that) he makes. This last new serie in 5 parts ending early this Month, talks about a lost man, from Arkham : Clark Elwwod, bewildered in cold and wild forest around of a strange town : Lamewood, lost itself in time. Here lies bizarre and rat looking (or zombies it depends of the moments) people, who dedicate cult to an ancient god, a giant Rat's looking diformed creature. This one lives down a cavern, and some human sacrifices are made for him. Our main character is running after his school's love : Kito, that happens going to be given in offering to the bloody rat. But is Clark really living the situations ? are we in presence of souvenirs ? did He ever met Kito and all theses creatures ?? This is how the comics let us at the end of the story. It is actually, in my opinion, one of the better stories made by the author himself. Mainly inspired by Lovecraft, from the name of the originated town of our anti hero, to the strange debut, putting us promptly to a non identified period, while driving us through wildnerness and foreign languages, it opens flashback all the time, before stabilizing the story in lakewood, but with no more realistic explanation at the end. So it is great ghost train promenade all the way, with superb color drawning, and many new characters, something that we not had the privilege to see since long time in Corben's work, except in Ragemoore, but with much less characters (and in b and w). At this subject, the first pages give us a reminiscence of another ancient story, abording the same themes : Dweller in the dark (1976; published in France under the title "La cité more de la peur", in Ogre, 1979). Well, as the title does not tell it : a great mini serie ! Well done mister Corben ! or Hard cover : 144 p. To be published in October 2015.